Earlier this week I finished up my Summer Stars quilt and delivered it to my friends with the Seattle Modern Quilt Guild. We are having a star quilt exhibit at Island Quilter next month (starting on June 7); if you are in the area you should go see the quilts! I am thankful for my getting-taller helper. The fence was wet and I couldn't hang the quilt up there like I normally do for photos. The finished quilt measures something like 61"x66". 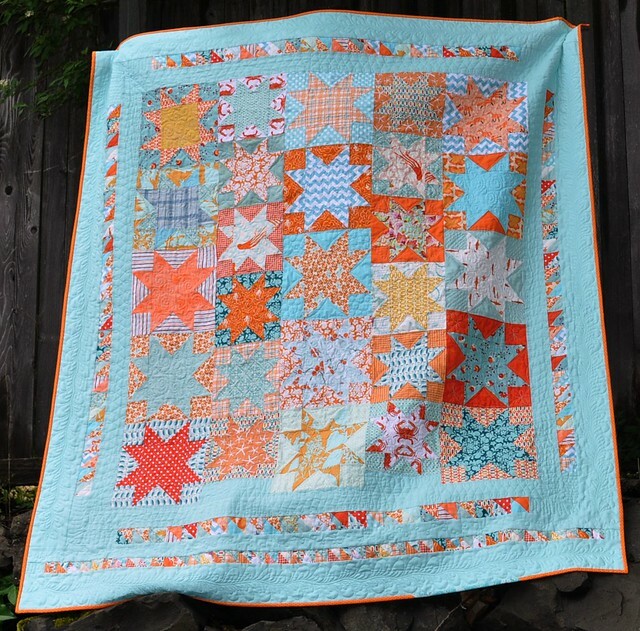 This quilt is made of 8" and 10" sawtooth star blocks using various new and old orange and turquoise/aqua fabrics. The borders are made from (most of) the half square triangles that were leftover from making the star blocks. I used Kona Aqua colored solid fabric for the borders. The Chinese character fabric was exactly the right length so I cut it into two pieces and then filled in the middle with the two leftover stars and some other smaller and bigger chunks of fabrics. The dark turquoise fabric along the top is the hanging sleeve for the show. There are 27 star blocks and I quilted a different design in the corner squares of each block. Kind of silly, but it was kind of a fun challenge to keep coming up with ideas. The following photo shows how I quilted the borders. There are three borders on the top and 2 sides, and five borders on the bottom of the quilt. I did a figure 8 loop for the inner border, circles in the triangle borders, and a double feather in the wider, outer border. along with the little section of turquoise in the orange binding. I'm in love! 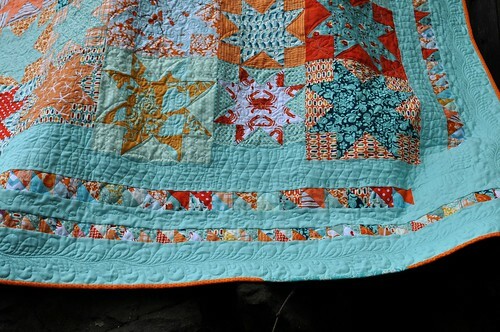 This is absolutely beautiful, from the colors playing together so very nicely, to the fabulous quilting, to the orange border with touch of aqua/blue! Absolutely love everything about this quilt Vicki! 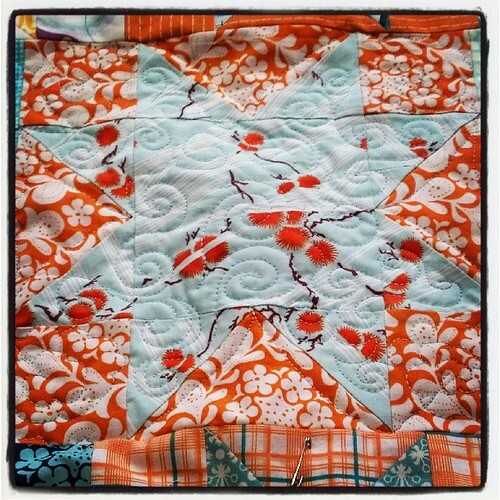 My favorite colors, the stars and great quilting! Beautiful. Wonderful! I especially like the figure eight loops in the borders and the swirls in the stars. Beautiful colors in this quilt too! Eye candy, indeed! I love how this came out Vicki! Such pretty colors! And I love stars. Your quilting is really amazing! I love everything you did! 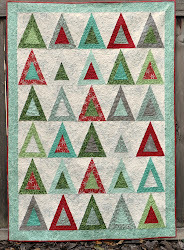 Such beautiful work and what a fun sew and tell for Blogger's Quilt festival! Beautiful, I love the quilting and the colours of the quilt. this a really pretty quilt!! Lovely quilt! I love the colors, so soft and cozy. I love this quilt! Great colours, great quilting! Well done on coming up with so many designs for the corners :) thanks for sharing! 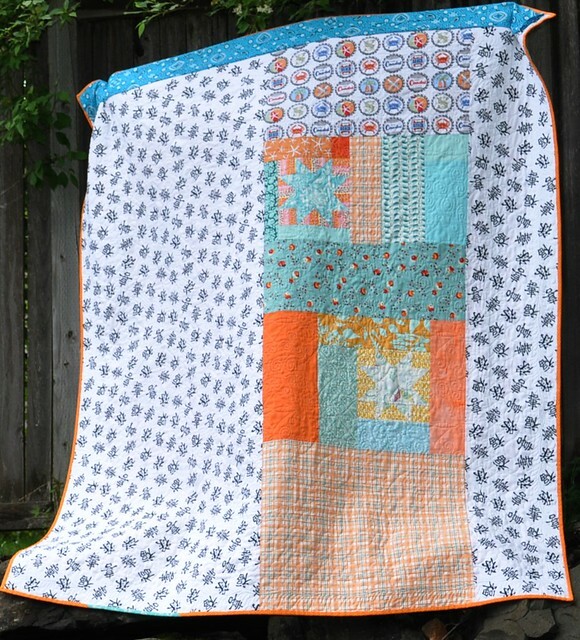 I love the colours in this quilt, orange and aqua and then all the different shades and solids and prints. It works so well and although I am not always keen on borders, your border works so well with the stars. It is wonderful. What a gorgeous quilt! 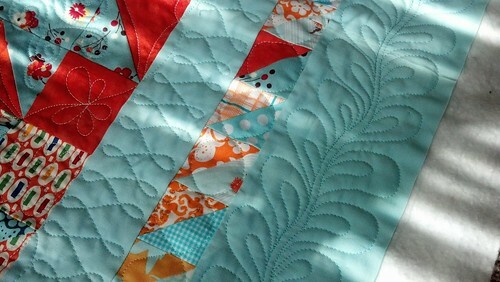 And the quilting is great, feathered borders are my favorite right now! I love the hst strips too. Orange and aqua are some of my favourite colours, and you did a great job combining them. Then the quilting has finished it off perfectly! There's so much to love about this quilt! The colours, the quilting, the creativity! My favourite colours! Beautiful job on the quilting - wow. Beautiful - especially love that blue! You did a fantastic job on the quilting. Your feathers look spectacular. I just used that figure 8 loop on a quilt and I love the effect it has. So pretty--it makes me happy just looking at it. I love the colors you chose ! Lovely and cheerful! I'll definitely put Vashon on my calendar for June, so I can see the rest of the starry quilts.